The Department of Agriculture and Water Resources develops and implements policies and programmes to ensure Australia’s agricultural, fisheries, food and forestry industries remain competitive, profitable and sustainable. The FPSC aim to raise awareness and to increase the collaboration between stakeholders of the Australian and New Zealand fresh produce industry, as well as establish global partnerships to better utilise the information available. Any outbreak of food-borne illness (even if not originating from on-farm) will impact the entire fresh produce sector, therefore fresh produce safety and traceability is of the utmost importance for all levels of the supply chain including growers, packers, processors, distributors, wholesalers and retailers. 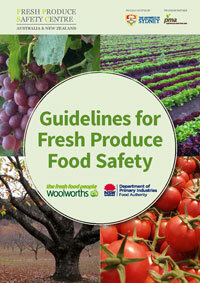 The FPSC website covers all aspects of fresh produce safety by supplying valuable information and resources, providing research with practical application, and identifying the knowledge gaps in fresh produce safety. FSANZ develops standards that regulate the use of ingredients, processing aids, colourings, additives, vitamins and minerals. The Code also covers the composition of some foods, e.g. dairy, meat and beverages as well as standards developed by new technologies such as genetically modified foods. We are also responsible for some labelling requirements for packaged and unpackaged food, e.g. specific mandatory warnings or advisory labels. HARPS is the Harmonised Australian Retailer Produce Scheme, funded by Horticulture Innovation Australia (HIA) at the request of industry. HARPS aims to reduce the costs associated with the adoption, maintenance and auditing of multiple food safety systems by individual suppliers to multiple retail customers in Australia. One audit visit, against a base scheme plus HARPS, means a direct vendor can supply multiple retail customers. Horticulture Innovation Australia (HIA) is a not-for-profit, grower-owned Research and Development Corporation (RDC) for Australia’s $9 billion horticulture industry. HIA invest more than $100 million in research, development and marketing programs annually. PMA Australia-New Zealand Limited (PMA A-NZ) is the first stand-alone global affiliate of the Produce Marketing Association (PMA Global) – the leading global fresh produce trade association serving member companies around the world, from Salinas to Sydney, and every segment of the fresh fruit, vegetable, and floral supply chain. Agsafe supports the safe and compliant handling, supply and disposal of agvet chemicals and their containers through three industry programs drumMUSTER, ChemClear and Accreditation & Training. These programs help farmers, chemical users and resellers with most aspects of their agricultural chemical activity. The Accreditation & Training program helps resellers from the point of sale, while drumMUSTER and ChemClear advise end users in the disposal of chemicals and the recycling of empty agvet containers. ChemClear provides Australian agricultural and veterinary chemical users with a collection and disposal pathway for their unwanted chemicals. Their goal is to reduce the quantity of agvet chemicals stored on properties and in businesses across Australia, thereby reducing negative impacts on the environment, people and trade in the future. ChemClear is delivered by Agsafe Limited on behalf of AgStewardship Australia Limited and its stakeholders CropLife Australia, Animal Medicines Australia Limited, Veterinary Manufacturer’s and Distributors Association, the National Farmers Federation and the Australian Local Government Association. Infopest, owned and managed by Growcom, a peak industry body in the agricultural sector, is a comprehensive Agvet chemical database available online for free. Infopest is a one-stop shop for accurate, up-to-date information for the effective control of weeds, pests and diseases in a wide range of crops and livestock. It is regularly updated with new and/or updated products and/or permits that have been registered or approved by the Australian Pesticides and Veterinary Medicines Authority (APVMA). Climate Kelpie is for Australian farmers and their advisors. It connects you to tools and information about climate to help you make decisions about your farm business. With teams in 30 locations around the country and over 150 staff, Greening Australia is an independent not-for-profit organisation aiming to conserve and restore landscapes at a scale through collaborative, science-based and innovative conservation programs. Greening Australia uses the latest science to guide what’s best for our landscapes and the people and wildlife that live in them. The second edition Guidelines for Environmental Assurance are a great go-to resource for Freshcare businesses who have implemented Freshcare Environmental, or are preparing to do so. The Guidelines cover the growing, harvesting, packing, storage and dispatch stages of horticultural production and provide a platform for environmental auditing and certification options relevant to Australian environmental issues. The Guidelines also provide a great supplementary resource for Freshcare Environmental and Environmental Viticulture participants on key elements in the Codes, such as the management of land and soil; water; biodiversity; greenhouse gas emissions and energy use. Australia is proud to boast more than 4000 community Landcare groups, 2000 Coastcare groups and many thousands of volunteers across the country. With the partnership between communities, government and organisations, Landcare volunteers all around Australia work together to repair and viably manage precious natural resources. Entwine Australia is the wine industry’s national environmental assurance program. It provides Australian winemakers and wine grape growers with formal certification of their practices according to recognised international standards. To qualify for membership, companies must be certified against an approved, independently audited environmental management system (such as Freshcare Environmental Viticulture and/or Environmental Winery) and report annually against a set of defined resource use indicators. Wineries also must report their greenhouse gas emissions.